kelbysews: I Baked Just For You! Head on over to Moda Bakeshop to check out my tutorial, but be sure to come back because I'm having a little giveaway to celebrate! If you're here from MBS, welcome! I was so excited to have my little project accepted--I even did a little booty dance. Don't worry, I'm not going to show you that here! :) Anywho! To celebrate my Bakeshop project, I'm going to be giving away these two sets! How stinkin' cute are they?!?!? My super talented friend Christine makes them and sells them in her etsy shop! She'll even make custom pins! She made some Green Eggs and Ham pins that are to die for! Christine has even set up a coupon code for you guys! Enter "KELBYSEWS1" at checkout. Welcome to the sewing world! And my favorie addiction - Moda Bake Shop. Your work looks like you have been sewing for years and so talented. You just won't believe this but I am just finishing my first set of chalk fabric placemats and my next (hopefully to start today) project is my own 'To-Do' list chalk cloth hanging. Never thought about the pockets so they will be added to my project. Thanks for the info. I'm so excited for you! I've been following Moda and your blog on RSS and can't believe this is your first project. I need to get my own creative juices going and start sewing. Love the fabric and pins! Congrats! Congrats Kelly on your MBS tutorial! Very cute. And I love those pins! I love this project when I first saw you post it....When you said you would be featured on MBS, I was wrecking my brain trying to figure out which project it would be. This a great one. i'm so proud of you kelly! that chalkboard organizer is fantastic, and i plan to make one for my new craft room!! Very cool project! I love finding new blogs to follow and will be adding you to my list. Thanks for the chance to win. That's so exciting! It is absolutely adorable!! Thanks for a giveaway too! Congrats on your bake shop project, very cute and original. YAY FOR YOU!! That's awesome Kelly. I can't believe you didn't share the booty dance with us! Please pick me. Please! please! please! I want the hoot! Awe it is a cute project! Congrats!! I have been wondering when you are going to submit something? So I work at a natural science museum, and told our Paleontology curator (who specialized in dinosaurs) about your nephew's name. His wife who also works at the museum came up to me the next day lamenting the fact that he now wants to name a future child with the middle name of his favorite dino "Acrocanthosaurus". Although she is saying hell no! LOL! I love your project! I bought chalkboard fabric to make the chalkboard quilt you made but this just takes it up another notch of awesome! Awesome tutorial! Those pins are all kinds of cute. Sure hope I win!! I found your blog from the moda bakeshop and can't wait to spend more time reading it! super congrats on you moda bakeshop tute! perhaps i should add you to my 'stitchy rockstars' blogroll?! How cute is your tutorial! Love it! I have been sewing for along time and have never seen chalkboard fabric...oh the possiblilties! I love your little organizer.....I will be making several of these for Christmas gifts this year.....thank for doing a great tutorial.....and thank you for the chance to win some great fabric and awesome little pins! What a great project! Is the chalkboard fabric hard to find? For a "Newbie", you do fantastic work! Congrats on being featured on the Moda blog! Welcome to a GREAT addiction! I started sewing in March 2009 and absolutely love it! Congrats on being a baker for Moda Bakeshop! Your tutorials are very well organized and written. 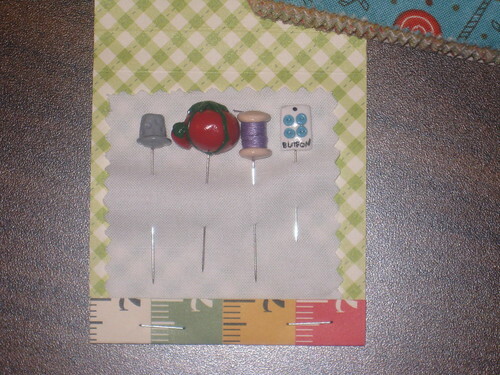 Love the fabric and the pins are super cute! Keep up the great work! Your chalkboard organizer is brilliant! I need to make one for my sewing room so I can remember which WIPs I need to finish, and to keep my clicky pencils and measuring tapes from vanishing. I love organizers of any kind! Your chalkboard is really one of its kind! Never seen one like that before!!! CONGRATS for making it as one of Moda's bakeshop bakers! I would be over the moon! Thank you too for your generous giveaways! congrats Kelly! Your project is super cute. I'll admit that I'm completely in love with the pins in your giveaway. I remember the green eggs and ham ones...didn't Amy send those to a swap partner? Love this organizer and the fabrics you have used are very cute too! I have a LOT of the chalkboard fabric and your pattern is great! Congrats on MBS. LOVE the Hoot package, and those pins are adorable! Congratulations on your debut! I love your project, I will have to make some of these for gifts. Love your tutorial and LOVE those pins! I can't believe you've only been sewing for a year now. You are super talented. Congratulations, your chalkboard organizer is a very clever idea and so cute! Thank you for this wonderful giveaway, love the pins! Congratulations on your Moda project. Very cute! 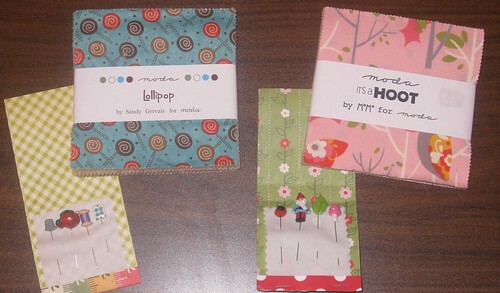 Moda Bakeshop was one of my very first fabric/sewing blogs that I follow and you are my latest. :) Thanks for the giveaway opportunity! Your Bakeshop is awesome, Kelly! So proud of you! Love your chalkboard organizer! Congrats on making it into the Bake Shop. Congrats on your moda project! Love those cute pins! Thanks for a great giveaway! I'm glad I found your blog, it looks fun and I like your projects. Your chalkboard organizer is darling! Something funny: my four-year-old recently commented, "Your nose is like a little suitcase for your boogers." Congrats on being featured at MBS! Fabulous project! I like the pockets. Your chalkboard organiser is adorable!! Seriously! and I love your pins! Congratulations on your MBS project being accepted! Great project! i'd love to win your giveaway. Congratulations on your first Moda Bake Shop pattern! Your design is very innovative. Thanks for sharing it, and your celebratory giveaway. I just found your blog today! Your little pouches are too cut. 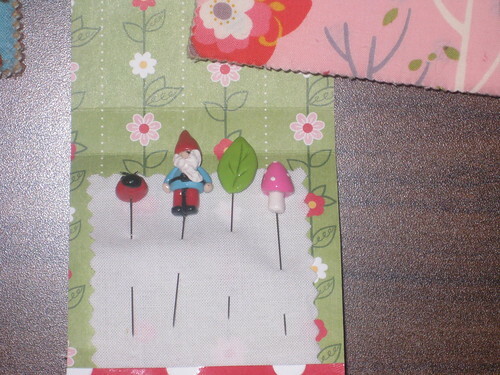 So is that set of pins with the gnome and pink mushroom. I am going to check out the shop now. I love your header(title for your blog - it's awesome. Did you make it yourself? Cute organizer! I need one for my sewing room. Thanks for the giveaway. I can't wait to see what other projects you have on your blog! The chalkboard is fabulous - I spied it whilst looking for inspiration for my Pips - think it's a done deal! The chalkboard is great! I can't wait to try it for my sewing room. You definatly inspire! WOW those are so cute! Love the gnome! All your sewing stuff looks great! So glad I clicked on over from MBS! First, what a fantastic project! I can't wait to give it a try, they'll make great gifts for all those birthday parties that the kids get invited to! AND a give away to boot! woohoo!! Thank you for sharing your project. Happy sewing! I love your tutorial & the pins are so super cute. Congrats & looking forward to seeing your other projects! What a great project! The pins are adoreable. Glad I found your blog today! I came here through MBS and totally adore your chalkboard organizer! Will have to make a few since my girls love chalkboards and I love patchwork quilting! Those pins are the cutest!